1) You don't have to count each bird, just keep track of the species. 2) I get to do it right in my own town which saves gas and I'm able to use my familiarity with the area to my advantage. 3) It's Spring! Great weather and lots of colorful birds. What could be better? I visited several of my favorite local spots. I saw quite a few Savannah Sparrows at Wangunk Meadows along with Greater Yellowlegs, Bald Eagles, and FOY-Baltimore Orioles, Black-throated Blue Warbler, and Northern Waterthrush. I finally was able to get close enough to a Wood Duck to get a decent photo. there was a pair in a corn field next to route 17. Usually they fly away before I even get a chance to see them or they're half a mile away. Mrs. Wood Duck seems a little camera shy. - I was able to find some other FOY birds in other locations around town as well. I climbed to the top of Great Hill to find my first of the year Black and White Warbler. At some powerlines on Old Marlboro Turnpike I found Prairie Warbler and Eastern Towhee. I was happy to see that the Prairie Warblers showed up this year since the power company cut down a lot of the cedars since last spring. In the nearby reservoir there were plenty of Blue-grey Gnatcatchers making their tiny squeaking sounds as they moved stealthily from tree to tree. - Here is of bird species that I, and another birder named Joe saw over the weekend. Any guesses on what our species total will be by May 17th? -Great Blue Heron, Turkey Vulture, Canada Goose, Mute Swan, Wood Duck, Mallard, Hooded Merganser,Red-shouldered hawk,Red-tailed hawk,Wild Turkey, Killdeer, Greater Yellowlegs, Spotted Sandpiper,Rock Pigeon,Mourning Dove, Belted Kingfisher, Hairy Woodpecker, Northern Flicker,Red-bellied Woodpecker, Downy Woodpecker, Eastern Phoebe, Blue Jay, American Crow, Tree Swallow, Northern Rough-winged Swallow, Black-capped Chickadee,Tufted Titmouse, White-breasted Nuthatch, Carolina Wren, house Wren, Blue-grey Gnatcatcher, American Robin, European Starling, Eastern Towhee, Black and White Warbler, Yellow Warbler,Yellow-rumped Warbler,Pine Warbler, American Redstart (heard)Northern Waterthrush, Louisiana Waterthrush, Chipping Sparrow, Song Sparrow, Field Sparrow ,White-throated Sparrow, Savannah Sparrow, Red-winged Blackbird, Common Grackle,Brown-headed Cowbird, Cardinal, House Finch, American Goldfinch,House Sparrow, Wilson's Snipe ,Bald Eagle ,Warbling Vireo, Baltimore Oriole, Palm Warbler, Northern Waterthrush Black-throated Blue Warbler, Swamp Sparrow, Osprey, Sharp-shinned Hawk, Ruby-crowned Kinglet, Cedar Waxwing, Northern Mockingbird, Double-crested Cormorants, and Prairie Warbler. Here is a short video of a Yellow Warbler singing. You can hear a second warbler singing in the background. I suppose they are trying to establish their property rights. What new migrants have you seen this week? My Search For Birds Led Me To Dinosaurs! I walked what must have been close to 20 miles through 6 different parks this past weekend looking for new places to go birding but despite my efforts, Yellow-rumped Warbler was the only new species of warbler for this month. The truth is that migrating birds don't care how hard you try to find them. They will go where they want when they want. I may not have seen the variety of warblers that I had hoped for but I did find some interesting things during my travels. The first photo is from a park in Middletown called Tynan Memorial Park. It passes by some farm fields and enters a wooded area that is lined with some impressive Hemlocks. The main trail connects with the Mattabasset Trail and trail to Mount Higby. I had never been to this park before and only came across it by chance later in the morning. The standout birds here were a singing Ruby-crowned Kinglet and..
this very vocal Northern Flicker. I came across a couple who were out hiking and we talked about birds for a few minutes. The Northern Flickers have been so loud the last couple of weeks that I've confused them with Pileated Woodpecker calls a couple of times. I also enjoyed watching of a pair of Sharp-shinned Hawks circling above my head before they glided off out of view. Another park that I visited for the first time was the 300 acre Canfield Meadow Woods Nature Preserve in Essex and Deep River. I used the trail entrance off of 154 in the town of Deep River. There are several old stone walls still intact throughout the preserve. They are the remnants of farms from 100 years ago. The Blue Jays were very active during my hike. They were displaying all kinds of vocal tricks including some nice imitations of a Red-shouldered Hawk call. The only warblers that I encountered here were Pine Warblers but some of the swampy habitat along with some steep rocky hillsides looks like it might be good habitat for other species later in the spring. The informative signs along some of the trails reminded me of the pop-up videos that they add to some of the movies on television. I assumed that this tree toppled over because the roots weren't deep enough. I didn't know that it was a beech tree and that parts of it that were alive. I think that this preserve would be worth a visit during the nesting season. The fact that the trees are not so dense should make for good viewing opportunities and I have a hunch that there could be some interesting nesting species here. I saw this Osprey perched next to Beseck Lake in Middlefield. It seemed to have a little snack tucked away under its foot. I thought that the names of the roads in the lake area were interesting. There were road names like: Seminole, Seneca, Algonquin, Pawnee, Pequot, Chipeway, Mohican, Iroquois, Cherokee, Kickapoo, Sioux and Chicopee. Do you think there might be a common theme there? I drove along shore of the lake until I located a hiking trail at the end of Mattabeseck Road. It was a fairly steep climb to the top of the hill. The place was alive with the sound of various woodpeckers calling, drumming and pecking away. There were lots of these porous rocks lying around. I think they are of the volcanic variety since part of a volcanic ridge runs through the area. I was impressed with all the Hermit Thrushes I found here which totaled five. I didn't see many over the winter so it was surprising to find so many. I found Pine Warblers, Yellow-rumped Warblers and Palm Warblers near the entrance which was just across from the lake. I chased a singing Ruby-crowned Kinglet for 10 minutes but couldn't come up with a worthy photo or video. They sure do have a big song for such a little bird though. After leaving the Beseck Lake area I took a ride up Powder Hill Road near the old ski resort. I saw a sign that said Powder Hill Dinosaur Park. At first I accidentally drove right past the park and into someones driveway. I was wondering where the park was until I realized that the rock area pictured above is the entire park. It wasn't until I actually walked over to the brownstone area and looked down that I realized why it was named dinosaur park. I couldn't believe that there were actual dinosaur footprints right out in the open! Most people in Connecticut have heard of Dinosaur Park in Rocky Hill. All the footprints there are carefully protected and preserved. This dinky little park has a worn out sign that is barely legible and the park is hidden away in this old section of town. Who put it there? Where did it come from? How come I've never seen or heard of it before? When I have time I want to go back and see how many footprints are actually out there. I also visited Hurd park in East Hampton. I seem to have good luck with Barred Owls. That seems to be the only owl that I find on a consistent basis. I assure you that I was not drinking when I took this video footage. I was in an awkward position on the hillside but did my best to get in record the owl before it flew off into the woods. Besides the owl, I counted 4 Louisiana Waterthrushes here. I noticed that starting from the main entrance there is a gradual decline all the way to the end of the park so I rolled my windows down, turned off my engine and coasted in neutral for almost the entire distance. This was a nice way to cover ground while birding by ear. I hiked down one steep trail that led to the river and spotted a secretive brown bird hiding in the mud banks along a stream. It turned out to be a Winter Wren. I would have to say that my most unexpected surprise of the weekend was the dinosaur park I found in the Baileyville section of Middlefield. What was the most interesting park that you came across unexpectedly? This Saturday, I met up with a friend from the Hartford Audubon to show him a few of my favorite local birding spots. Our first stop was at the Portland Fairgrounds where we found a flock of Wilson's Snipe sitting silently in the wet grass along side the skating pond. Some of the other species we found here included a Red-tailed Hawk, Killdeer, Belted kingfisher, Red-winged Blackbirds, Rough-winged Swallows and Tree Swallows . We visited several other locations but our best moments came on one of the dirt roads in the Meshomasic Forest. I rarely see birds reported at this location but there are plenty of birds to be seen in this forest, especially during Spring Migration. As we were driving along the dirt roads we spotted an Eastern Phoebe that had made itself at home next to a small stream. After seeing what seems to be an endless supply of robins it was a real treat to see another thrush, the Hermit Thrush, standing silently on the ground amongst a patch of leaves. What I was really hoping to see was the first warblers of the Spring Migration. Each new species of warbler that I see in April is an individual event. They have been gone for a year and I look forward to seeing each new species of warbler one by one. Palm Warbler-I saw eight Palm Warblers at the Portland Reservoir on Sunday. They moved as a group in the lower branches making soft trills and chip notes all the while wagging their tails. Pine Warbler-I hear quite a few of them hiding in the pines but only had a good view of one that perched at the top of a tree for a few seconds. Every year I have to remind myself of the difference between the sound of a Chipping Sparrow and the Pine Warbler. Louisiana Waterthrush -This was the birding highlight of my weekend. I hear the waterthrush singing before I even parked my truck. We we able to locate the area from which the bird was singing then managed to call it out with an Ipod. It landed on a branch just ten feet from us and put on a great singing display. It gave us wonderful views although the lighting was not favorable for taking pictures or video. If you click on the April 2008 post titled Camping And Birding In Kent Connecticut, you will find two videos that feature the Louisiana Waterthrush singing. I had much better luck capturing this video of this Palm Warbler. It repeatedly fluffed its feathers out as it preened. Actually the word fluffing probably isn't a good description. It seemed much more dramatic than that. I visited this heronry (undisclosed location) and tried counting the nests. I gave up after tallying 100 nests when I realized that many of them weren't within my view. I decided to start using the word heronry as opposed to heron Rookery after reading this post from the Body Soul and Spirit blog. I came across a small flock of Cedar Waxwings in Wangunk Meadows.It seems they were lining up on a branch to have their picture taken. They didn't seem to be very camera shy. Are they proud of the way they look or maybe just a little drunk on berries? If you listen closely you can hear the high pitched bzeee notes of the waxwings. They make one last alarm call before flying off in search of another worthy branch upon which to form their magic line. Have you seen your first warblers of spring yet? There have been two wonderful announcements for birds in the past week or so. 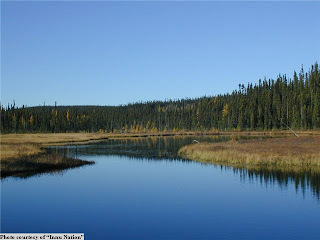 It started last Sunday when the Premier of Quebec, Jean Charest, announced that the province of Quebec was protecting around 4.5 million acres of Boreal Forest through the creation of 14 new national parks and adding land to an already existing park. The total land protected is more than double the size of Yellowstone National Park (around 2.2 million acres). This has enormous implications for many of the migratory birds that breed in the Boreal Forest to our North. While many of us get excited in the spring for incoming migrants like the Blackpoll Warbler, it’s easy to forget that their health and numbers largely depend on the status of their breeding grounds in Canada. 300 of the 700 species of bird that occur in the US and Canada breed in the Boreal Forest. Just one day later, the US added to the momentum. President Barack Obama signed a landmark conservation bill that protected around 2 million acres spread across 9 US states. The land protected included a diverse selection of wilderness, including wetlands, forests, and desert – all of which will be beneficial to a wide variety of North American birds. Together, about 6.5 million acres were permanently protected over the span of two days and two countries. While the timing was coincidental, this one-two punch of great news made last week a truly great week for North American birds and the birders who adore them. Osprey Mate-feeding Ritual, and A Lifer! I spent some time at Rocky Neck State Park in East Lyme on Saturday. This park is not as popular as Hammonasset amongst birders because it has less habitat and probably fewer species on an average. There are a couple of nice viewing platforms overlooking the marsh. It turned out to be a great spot to see both Snowy and Great Egrets. I saw at least a dozen of each. I like watching egrets lift their feet out of the water. You can see the blackish legs and feet on the Great Egret in the above photo. I seem to get better results taking photos of white birds on overcast days when my camera is in auto-mode. (Click on the photos for more detail). Excuse me- Mr. Great Egret, Can you tell me where I can find a Snowy Egret? Over there? Okay, thanks you. This adult snowy is showing off its yellow feet which really contrast with the black legs. They also acquire lacy plumes on their head neck and back during breeding season. The plume feathers are noticeable on the back of this bird. In the late 1800's the plume feathers of the Snowy Egrets were popular decorations for women's hats with the feathers being were worth twice as much as gold at the time. Snowy Egrets were nearly hunted to extinction before laws were passed to protect them. Here's a short video of the Snowy Egret gracefully making its way through the marsh. I saw this flock of birds fly overhead. Identifying birds in flight is not one of my strong points but the bills on these birds give them away so I have a pretty good idea of what they are. -Care to venture a guess before clicking the link? I was driving to work on my way home from work last week when I saw a large white bird mixed in with some Canada Geese. It was grazing on the front lawn of the Bizhub corporation. At first, I thought it might turn out to be a Greater-White-fronted Goose which I had seen at the same location last fall. Upon closer inspection, I decided it was probably a Snow Goose based on its size, color, and black feathers on its wing tips. The problem was , that I had never seen one before and didn't have my binoculars with me. I came back two days later with binoculars and a camera. Luckily, the goose was still there. I was able to use the gigantic Bizhub sign as a bird hide to help me capture a photo and now it's officially a lifer. This video was taken at the Four Mile River State Boat Launch in Old Lyme. There are a lot more platforms at Great Island Boat Launch but this one gives you the best view. I stayed in my vehicle so as not to disturb them. - Soon after the female arrives, the male begins to bring food to her. The female may take the food to a perch to eat, returning after her meal with material to line the nest. I was glad that I took the time to read that because there seemed to be a pattern to what I observed the Osprey doing in terms of catching fish and collecting nesting material but I wasn't sure what the pattern was. Little discoveries like that make bird watching more interesting-wouldn't you agree?